Unfortunately I don’t have any pictures of the build – wish I did in retrospect. I made the knife about three years ago now – soon after it first came out on the website. 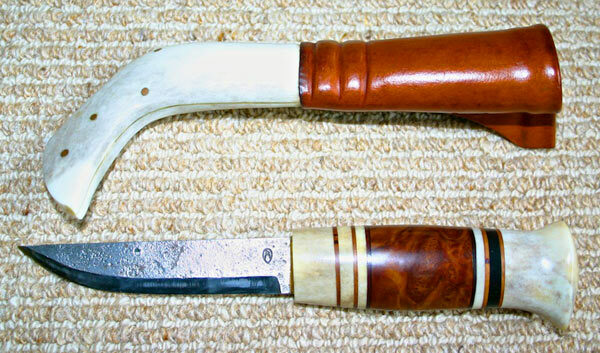 Tracking down the materials was interesting and introduced me to the subculture of Scandinavian knife making. I followed Ulf Avanders book as best I could and tried to use authentic materials; all apart from the piece of buffalo horn for contrast and the bit of exotic hard wood, the name of which I have forgotten. It was a great project and I recommend it. I still haven’t got round to the Scrimshaw – maybe one day. 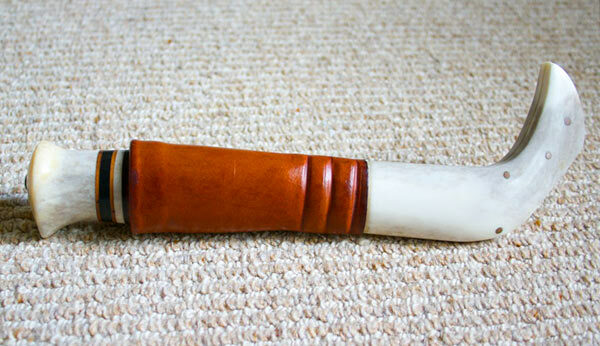 This entry was posted in Bushcraft Clothing & Equipment, Customer Posts on April 28, 2011 by Woodlore Team. Great little Sheath Knife you made there bud, great job! Great job on the knife and sheath, Nick. Very beautiful.